Metcalfe is a rural village 20 km east of Castlemaine. It is situated in hilly country and is on the Coliban River. It was the administrative centre of Metcalfe shire, 1865-1995. It is thought that Metcalfe was named after Baron (Charles) Metcalfe, Governor-General of India and later Governor of Jamaica and Governor-General of Canada. During 1856-57 land sales occurred in the Metcalfe area and a government reserve was set aside. In 1861 the Metcalfe road board built offices in the reserve, and these subsequently became the shire offices (1865). Some mining was carried out in the area. 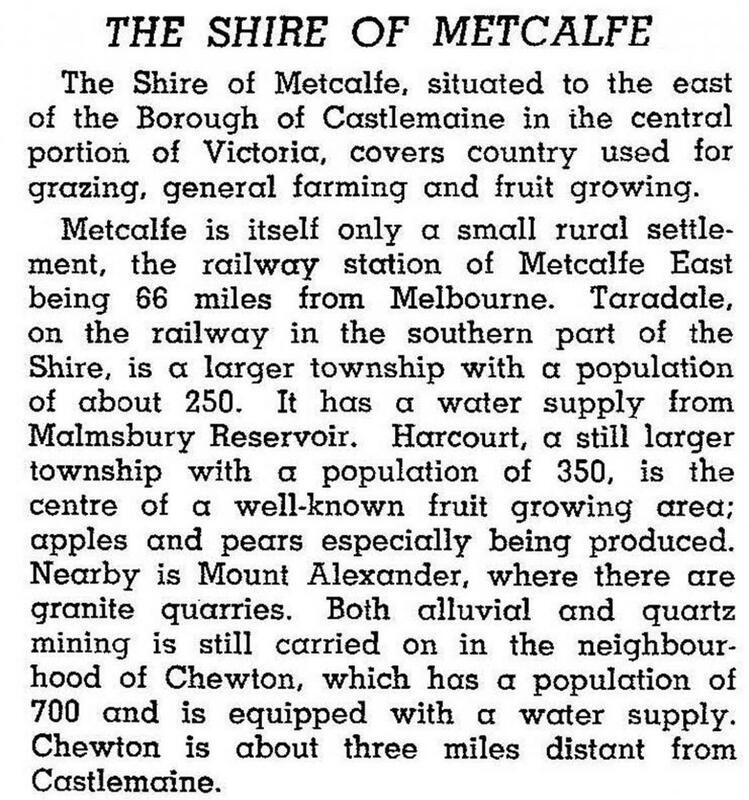 Metcalfe, however, was situated on minor routes between Taradale, Redesdale and Kyneton, and scarcely grew beyond a hamlet. Nevertheless, new shire offices were built in Metcalfe in the early 1870s. Other localities in the shire included Barfold, Barkers Creek, Elphinstone and Sutton Grange. The Calder Highway runs along the western side of the former shire. The shire’s population increased from the 1970s. In 1975 it had substantial numbers of rural retreaters and permanent residents who had left Melbourne. Rural retreaters comprised 23% of the ratepayers, and 30% of them were in the Chewton riding. Sixteen percent of the shire’s agricultural land was held by rural retreaters. In 1994 the shire’s main farm activity was sheep and lamb grazing, of which there were about 120,000 head. On 19 January 1995, most of Metcalfe shire was united with Castlemaine, Newstead shire and most of Maldon shire to form Mount Alexander shire. Its area was 592 sq km.